Built in 1911, this grand Monrovian Craftsman was originally known as The C.H. Reed home. 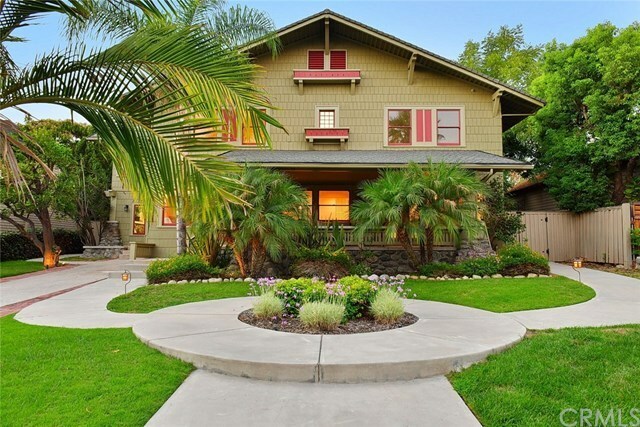 Today, this property is known as 217 E. Greystone Avenue located in the heart of the city, north of Foothill. Just a short walk from Monroviaâs historic downtown district, this expansive home offers vintage charm with modern amenities. The charm begins at the inviting porch area that greets guests and beckons them to sit back and enjoy the lovely and lush surroundings. Upon entering the home, opportunities abound in itâs layout with six bedrooms and five bathrooms, of which two bedrooms and two baths are located on the main floor. An impressive stone fireplace can be found in the living room as well as in a cozy room that can be used as a home office or library. The flow between the living room, kitchen, and dining room offers inviting spaces perfect for entertaining. A more casual environment can be enjoyed in the spacious family room with French doors that lead out to the resort-like backyard. Step outside to enjoy the outdoor spaces where you will find an expansive patio cover situated next to the pool and spa making this an ideal spot to enjoy hot summer days or dining under the stars. Just beyond the pool area is an additional space that can be used as a guest or pool house complete with a full bath and air conditioning. Truly this home must be visited in order to fully appreciate its special charm and all that it has to offer. MILLS ACT HOME WITH REDUCED PROPERTY TAXES.